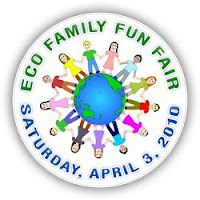 We had a delightful day yesterday at Seattle's Eco Family Fun Fair. What a great event! Organized completely by dedicated volunteers from the Seattle chapter of the Supreme Master Ching Hai International Association who understand the climate change emergency and who want to inspire and encourage families to do something about it, it was a day of stimulating speakers (including world champion vegan athletes), excellent vegan food, and the neatest eco games and fun activities for the children. There were also information booths on youth and fitness, how to be a healthy vegetarian/vegan, solar power, biofuel, and more. Here's the wonderful part. This group is going to share their game designs (why reinvent the wheel? ), so if you're interested in putting on an Eco Family Fun Fair (at a school or church, perhaps), let me know and I'll put you in touch.